The Trinity Hall community celebrated its first annual Family Day, where students invited their family and friends to come spend the morning at the school on Feb. 18. Faculty member Kristy Geoghan, who organized the event, said the school created Family Day so that the grandparents, aunts, uncles and close family friends could be introduced to Trinity Hall. “We are very lucky that we have such great parent support and parent community, and we wanted to expand that,” said Geoghan. Freshman Mairead Mark, Class of 2018 president, gave a speech on leadership and introduced the student council leaders. It was her first official speech as class president. “I can say I was nervous before because I had never spoken in front of a crowd like that, but I was confident because I had practiced beforehand, and I knew that the audience was just family members and there was nothing to be afraid of,” said Mark. After student council leaders explained the work of each of their councils, sophomores Marissa Crespo and Abby Marcin, and freshman Emily Knepple acted out an improv scene. The event concluded with the students giving their families a tour around the school. “It was really nice to see so many people all in one place supporting the school and their daughters, granddaughters, nieces, cousins and friends,” said Geoghan. Freshman Alex Principe invited her mother, father, stepmother, stepfather, aunt and cousins to come visit. She said that her family definitely seemed to enjoy the day. “I felt proud that I had accomplished so much here and that they got to see it,” said Principe. Geoghan said that there isn’t anything specific that she has in mind to change for next year, as the school plans to make it an annual event. 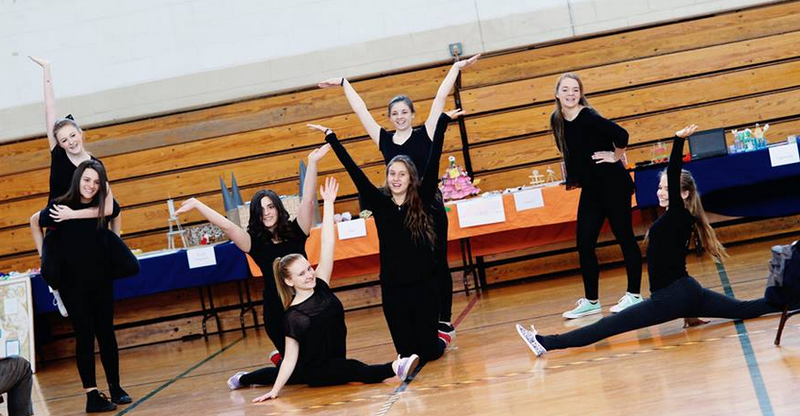 “I think that our students do such a good job presenting so we will continue to have the students be the feature of Family Day,” said Geoghan.